Vendor Relations – Hire The Best You Can Afford! 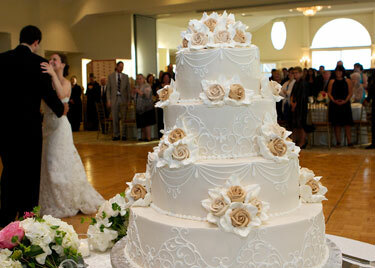 Hiring a talented, creative and cooperative team of people is essential to planning a great wedding. 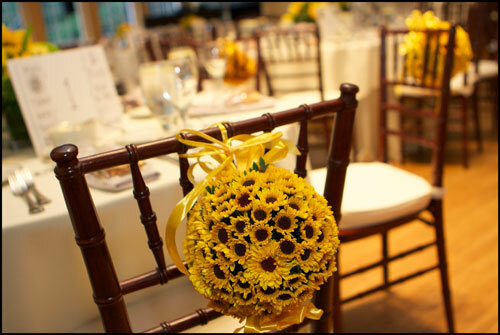 From caterer to chauffeur, florist to photographer, all the vendors have their role in making your dream come together. Finding the right vendors is a critical part of your planning process. The first step should be research. There’s a lot of talent out there! Traditional resources for wedding planning have been in print media. Wedding books and magazines are readily available at bookstores, libraries and newsstands. These can be a good place to start. Wedding trade shows can be a way to meet a lot vendors quickly, but these events tend to feature the “mainstream” operators who pump out a standardized product. If you are looking for traditional, simple and easy wedding, a “show” may be a great start. These kinds of events are held in most major cities at least yearly. Look in your local bridal magazines for listings. Wedding related websites have made the internet the biggest vendor resource. National sites offer lots of articles and advice, and user forums for brides-to-be share ideas and advice. Many offer lists of local vendors as well. Local or regional wedding websites can offer plenty of good info on what’s available in the areas they serve. 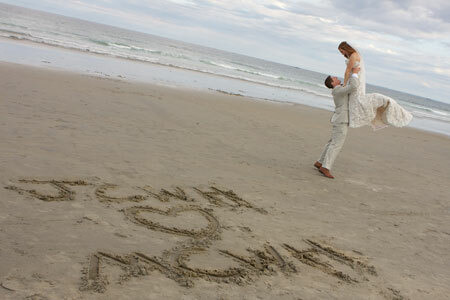 Finding a good local site can really help in planning a destination wedding. And don’t forget, we all know someone who’s just gotten married. The best possible recommendations can come directly from your friends and family who have first hand experiences with vendors through the whole process in the real world. They might also provide second-hand books and magazines, web links, etc. Many established wedding vendors get 50% or more of their new business from referrals! From the initial contact to the interview, your goal is to decide if the fit is right for you. Do your personalities feel like a good match? Can you work together effectively and efficiently? Questions about price, contracts, and references should be addressed. Open and easy conversation about the details of the planning is part of an effective relationship. Discussion of issues like payment terms, tipping etiquette, or staff attire should never seem strained or uncomfortable. 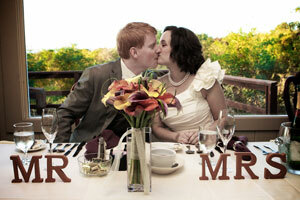 The intimate and personal nature of a wedding demands a sensitive approach. Good vendors understand this, so it’s good to keep your eye on it when you start your research and interviews. If there is tension or unease, move on. Another route would be looking for a wedding planner or wedding consultant. The expertise of a talented, creative planner can be quite valuable. They can help in a variety of ways from suggesting overall style, scouting locations, researching vendors, booking interviews, even as much as hiring all the vendors for you. Depending on your style, budget, and personal schedule, this option may work wonderfully for you. Most people are not familiar with the wedding industry. It’s unfamiliar territory. Having a veteran lead the way may be the right strategy for you. The typical, traditional American wedding has a basic structure. The reason for this is simple. For most vendors, success comes from following set routines that have worked in the past. Routines work. But don’t despair! A more personalized and uniquely stylized day can easily be created. If you plan to break the mold make sure you communicate all your special needs and expectations clearly. See how potential vendors react and assess their willingness and ability to accommodate you. Listen to your vendors’ suggestions, and work with them to customize their services to fulfill your wishes. Be sure before you hire a vendor that they understand exactly what special services you want. Be sure that your contract with them includes this part of your agreement. Clear communication in your collaboration with your vendors is the key and will prove to be successful in getting you those special details that will make your day your own. Your relationship with your vendors should from the first contact be building the trust you need to relax, and let them do their thing while you enjoy your day. You hire them for the confidence they inspire in their professional expertise. Now that you’ve hired the best, let them do their best. Set them free to dazzle you. You’ll be too busy enjoying your wedding to micromanage all the details. No worrying about the cake-cutting knives or the groomsmen’s boutonnieres. 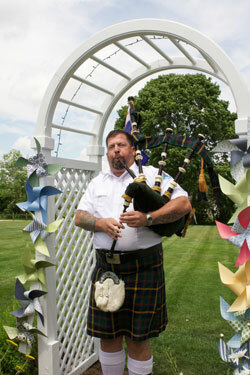 No panicking over whether the bagpiper will ever show up or how your wedding cake will handle a hot July afternoon. You cannot get stressed over every detail on your wedding day. The right vendor choices can make or break your day. Take your research and planning seriously, and all those months of planning will pay off with a relaxed, fun and wonderful wedding day. Your wedding photography will be with you for all your years together. Selecting a photographer who understands how you want to remember your day will ensure that all your memories are picture-perfect. Just like the other details of the day, the photography can have a distinct style. From traditional to photojournalistic, your choice of photographer can make a huge difference in your experience. No two photographers work the same way, and their portfolios will show it. Your wedding day will be the most photographed day of your life. As the bride and groom, you will be in almost all of the photographs. For most couples, this is a new experience. It doesn’t have to be a bad one. If the flash of the cameras makes you feel as though you were being hounded by the paparazzi, choose a photographer who has a less intrusive manner. If you’re looking for a high-production, fashion-styled day, then choose a photographer suited for that. Personality is the key to finding the right photographer. 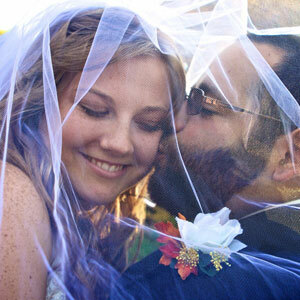 Your photographer will be a very prominent fixture at your wedding. It has to be someone you like and enjoy being around. As with most things, communication is essential. Having a clearly defined vision of your day will help you to successfully interview photographers. Knowing and expressing what you want is the starting point. 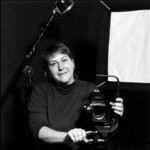 A great photographer is expecting your participation, and even your collaboration, with the photography choices. Photographers develop a consistent, personal style as they get more experienced. They learn what works and what doesn’t. This really comes out in the final product, especially the wedding album. The photographs are the story of your wedding. How they are edited and sequenced can profoundly affect how your story is told. A simple set of wedding proofs can create many different stories. For example, lots of formals and a structured timeline or perhaps more candids and a conceptualized flow? Each photographer establishes a unique approach to creating an album with couples. Looking at sample albums can give you a sense of their techniques. By working together, the right choice should become apparent. The best way to express your style to your photographer is by creating a list of your goals. The number of hours of photographic coverage is a good start. Do you need the entire day covered? Begin with the bride getting dressed, the groom pinning on his boutonnière, or the wedding procession. End with the couple’s last dance, the bouquet toss, or the couple’s departure from the reception. Do you want to professionally capture those late-night disco dancers and the wee hours of the party, or can your guests’ cell phones and point-and-shoot cameras take care of those? Your total hours of coverage are a large portion of the bill, so establishing this will be important. 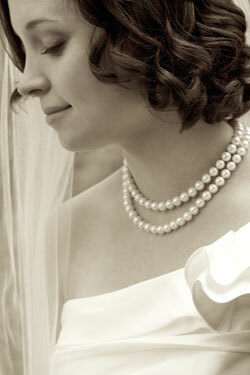 The glamour and classic elegance that black & white photography brings to a wedding is becoming more and more popular. 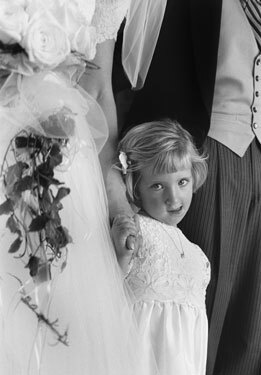 Weddings and portraits will always be suited to the classic look of it. Color and black & white photography can be successfully mixed to capture the day. With the advances in digital photography, beautiful black & white photographs can be made out of any color image. It’s no longer necessary for a photographer to choose between color and black & white. Every photograph can be whatever you choose without sacrifice. Deciding on a final product, whether a wedding album or just prints for framing, will also help to narrow your choices and your budget. It may help to ask your family and friends for advice. Why give your parents an album, if they would prefer some enlargements? Save your money, and get them what they want. If you’re a crafty person, then making your own album may be the right path, but that’s another post! By clearly defining your photography goals, your search will be more productive. Use these goals as a shopping list to help make an “apples-to-apples” comparison between photographers. The differences in their pricing and products can sometimes make this difficult. 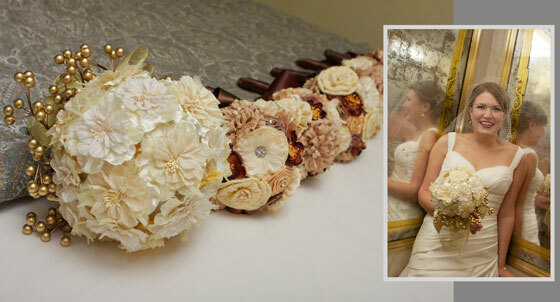 The photography of your wedding offers a lot of possibilities. Putting a little effort into making the right choice will pay off on your wedding day and every time you look at your pictures. “Will you marry me?” The question may seem small, but the answer is huge. What exactly that “yes” implies is uncertain and yet exciting. How? When? Where? The list of details, questions, and issues seems endless. While the planning can be overwhelming, it should never be seen as a chore. Nowadays, with the wide availability of wedding resources (books, magazines, online), it is less daunting. This process should be a uniting experience for you as a couple, as well as your family and friends. “We’re getting married!” It’s the outward declaration of your inner commitment to one another. This seemingly simple sentence can require 6 months to more than a year to realize. What will your wedding say about your commitment and the start of your future together? 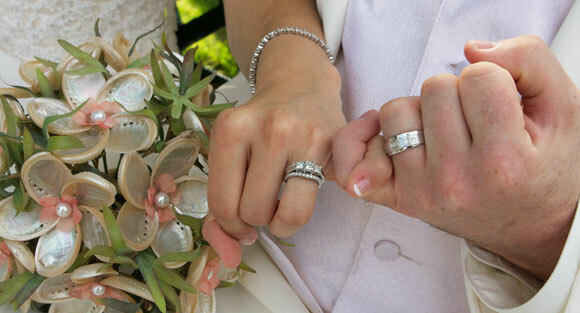 Symbols of your union, both as a couple and as a family, will help set the stage for the day. Stylistic choices reflect your priorities and values. The wedding celebration is the beginning of your marriage, your life, and your hopes for the future. 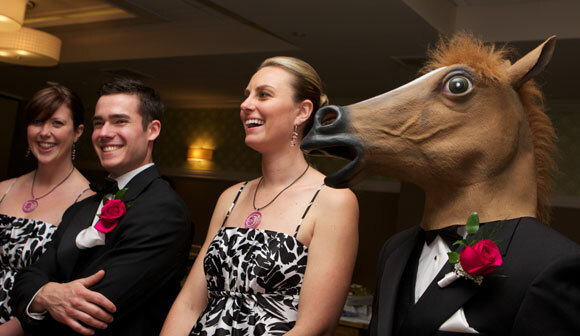 As a wedding photographer, I have intimate access to the wedding party. I am uniquely positioned to witness all the nuances of the day. Recording all the details, interactions, and emotions gives me, even as an outsider, a special perspective. It’s not uncommon for my role to become more than just the photographer. I’m a wedding coordinator and planner, an etiquette advisor, a family therapist, a confident. On a few days, the seamstress, the bartender, and oyster shucker! The personal nature of this business requires it, and it just feels right. After 600+ weddings, I trust my instincts. What works, and what doesn’t? Most couples desire consulting of some sort. It’s only natural to seek advice. 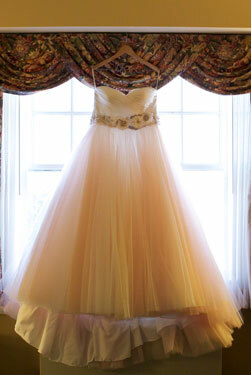 The articles presented here for discussion will address many areas of wedding planning. 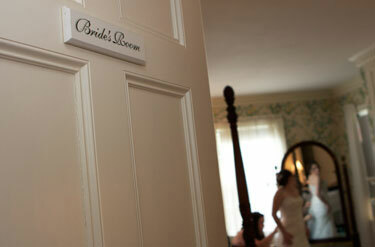 As some of the basic questions are answered, the structure of your wedding will begin to emerge. Little by little, the day of your dreams will become a reality. When I think back on my favorite weddings, they all had one thing in common. Once the day began, the couple let go of all the planning, the months of preparations, and their large binder full of notes and simply had a great time at their party. You have to trust that you’ve hired great vendors, and let them do their jobs. When the little glitches happen, just keep smiling and let it roll off. The bakery delivered someone else’s cake, the limo driver is 30 minutes late, and the ring bearer is in his terrible twos. No worries! Just concentrate on why we’re here: Your love for each other on this special day. The advice and information provided in this journal are meant to help you attain this freedom on your wedding day. Knowing that the right preparations have been made will give you that. All of my clients say, “The day went by so fast!” Savor every minute of your time with friends and family. The sounds of the music, the tastes and toasts…every bit! Welcome to Wedding Insider’s Journal! Over the last 20 years, I’ve photographed over 700 weddings. I’ve seen, from an intimate perspective, everything from wonderful weddings on a shoestring budget to “6 figure” affairs that were complete disasters. I’ve acquired a lot of insight from the practical knowledge gained from such experiences, even in areas other than photography. It’s been a great sociological study in the American wedding. So here we are. 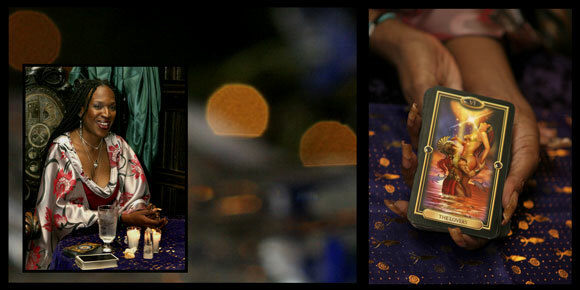 My journal is all about weddings from the photographer’s viewpoint, my perspective. It’s my pleasure to share tons of photographs, great ideas for wedding details, locations, and plenty of awesome couples with all types of unique expressions of their love. I’ve been honored to photograph and be part of their special days. I welcome you to my web community. I welcome your participation. Read the articles. Respond with your own thoughts, questions, and experiences. Help others who are in the throws of wedding planning as they help you to make your day picture perfect! 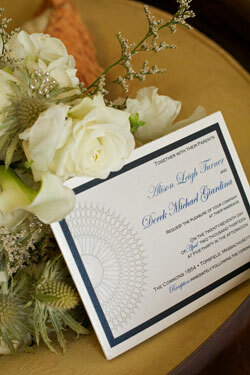 It is my sincere wish that the information presented here would empower you to have the wedding of your dreams. 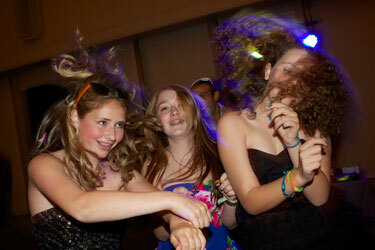 When party entertainment comes to mind for most people, the music is the main consideration. However, this category contains a wider cast of characters than that. Sometimes, even this veteran wedding photographer can be surprised. 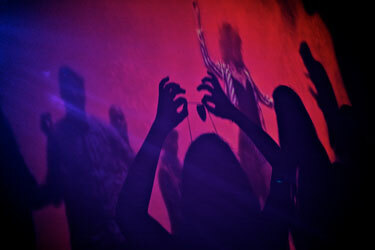 Far beyond the typical bands and DJs, the availability of unusual entertainment is better than ever. Clowns, magicians, comedians, performance artists, dance performances, palm readers, costumes for a photo booth…if you want it, it’s out there. Providing outlets for the distracted, high-energy craziness of thirteen year olds seems obvious, but at a wedding? Yeah! These special extras can help to reinforce a wedding theme and give your wedding a unique personality. Adults enjoy cutting loose, too. So, it’s not just for the kiddies. Looking for talent that falls outside the typical wedding genre may be the right path for you. Most people have experienced the power of flowers. There’s a huge emotional connection. It’s not just women; everyone has a connection to flowers. These fragile blooms are a romantic symbol between couples starting with their courtship. They represent thoughtfulness and love. They have an ability to set the mood and to transform any surroundings into a beautiful setting with color, texture and fragrance. The natural elegance and sophistication that flowers bring to a wedding is an important part of the overall style and personality of your wedding. Whether casual or elegant, the range of possibilities is quite endless. The amazing array colors and hues can match any color scheme or even establish a theme. Creating wonderful textures and contrasting forms with foliage and berries can add a unique and dramatic touch. 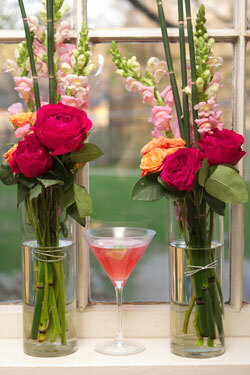 Find special locations to use flowers throughout the day. From a crowning headpiece on the bride or flower girl to the boutonnieres of the groom or groomsmen, flowers can become important fashion accessories. Issues of color, size, and even weight should be addressed. Having a good sense of scale is helpful in matching your flowers to your personal stature. Your flowers should never visually overwhelm their surroundings. Whether as a bouquet held in front of the bride’s gown or as pedestal urns flanking the couple during the ceremony, the role of the flowers is to support the show, not steal it. Beyond their traditional uses, flowers can make an appearance in all types of places; as centerpieces at the reception, as wedding cake decorations, on the guest book table, or even in the restroom. There are many situations that could be improved with a small splash of flowers. 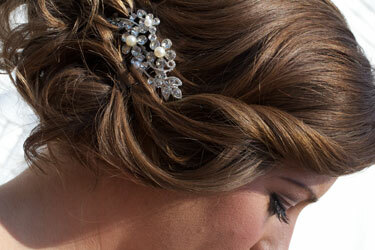 For holiday weddings, the traditional motifs can be followed. Playful combinations of seasonal fruits and berries with blossoming branches and foliage can make for memorable wedding decorations. Evening weddings provided an excellent opportunity to use candles in conjunction with floral arrangements. Candlelight always adds a dramatic and romantic effect to any table display. The possibility of using the arrangement as a giveaway adds another benefit. There are several concerns that should be addressed when ordering and handling flowers. Ask your florist about wilting, discoloration, proper storage, and other factors dealing with longevity. You want your flowers to look their best as long as possible. An easy answer to keeping the bouquet fresh the longest is to use a bouquet holder or vase with water. 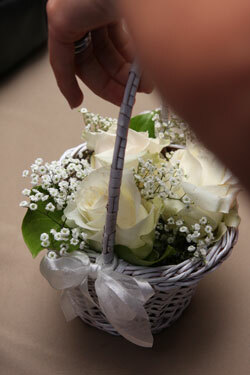 This provides an attractive way to store the bouquet when it is not needed. Another simple, yet overlooked question: Are they poisonous? 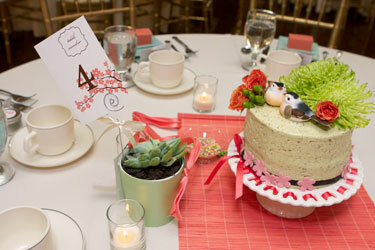 A wedding with small children or pets should consider this. What about allergies? Allergies to flowers seem more common these days. The entire Lily family does a number on me; but worrying about all the guests and all their possible allergies can be a little absurd. So, concentrate on yourself and everyone who will be wearing or holding the flowers, since they are the ones who will be the most affected. Some people also have strong reactions to flower scents. For example, gardenias have a very pungent aroma. These scents can bring back memories of childhood, specific people, and distant locations. These days, truly exotic and unusual flowers are available year round. Seasonal issues are not as problematic as they were in the past. 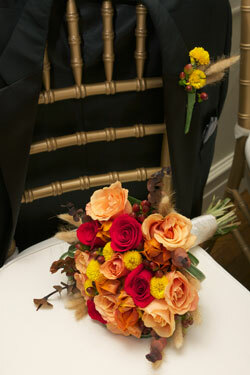 Using silk flowers will remove the seasonal issue and will lower the overall cost. The longevity of artificial flowers has its obvious benefits, but will it meet your aesthetic needs? 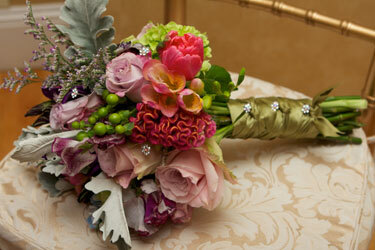 As with most other wedding topics, there are many choices for the flowers. So let your imagination run wild. Open a dialogue with your florist, and discover the possibilities. Your wedding is your day to shine. You want that inner glow to come out, in person and through the camera. Concerns about skin care, nail care, hair care, and fitness can all become overwhelming. Many people tend to result to the “makeover” as a tool for personal improvement. The popularity of reality TV shows featuring radical makeovers has increased the desire of couples to push the boundaries. 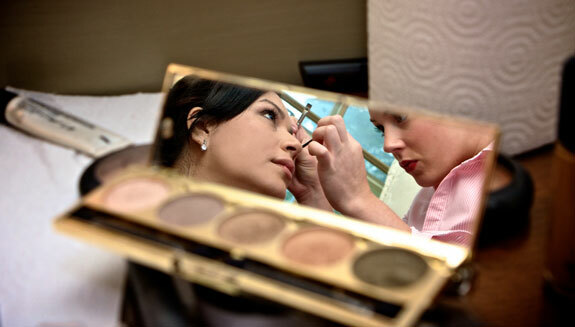 Everyone wants to look good at his or her wedding, but don’t let yourself be made over entirely. Well-meaning friends, beauticians and makeup artists can get carried way. You want to recognize yourself in the mirror, in the photos and most importantly, in the eyes of your sweetheart. Getting married is, by itself, a big change in self-perception. As a photographer, I notice the changes that people sometimes choose to make. Last minute hair color changes or shaving off a 10 year-old mustache are definitely big changes. Two days before your wedding may not be the best time to experiment. As for your skin, attempting a new beauty regime immediately before the wedding is not advised. Facials, masks, face creams, and waxing may be helpful in the long run, but they can cause breakouts and skin irritations in their initial use. Planning ahead for these occurrences can prevent the nightmares. By starting a routine months prior to the wedding, most people’s skin will have a chance to improve and to settle down. 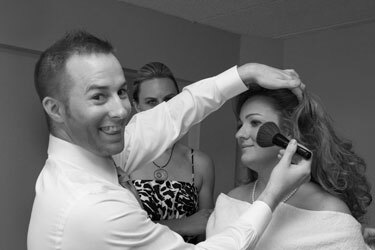 And don’t worry if the monster zit shows up on the big day; most photographers can retouch! Despite their claims, beauty products cannot compare to a simple, commonsense understanding of your own skin. While fighting your genetic predisposition is not entirely futile, radical changes can be extremely expensive, time consuming, and downright embarrassing. If you feel that things are out of control, consulting a dermatologist, make-up artist or esthetician may be helpful in finding the correct beauty regime for you. Think carefully and try things well in advance of your day. A little common sense can go a long way. A good night’s sleep is priceless. Beyond your wedding being a very long day for you, it’s a very hectic and stressful day. The body really shows when you haven’t had enough sleep. Taking a little extra time for yourself will have many positive effects. Your posture will improved. Your skin and especially, your eyes will be dramatically improved, as well as your mood. Finding other avenues for stress-reduction will have many positive effects. I know, easier said than done. The night before the wedding may seem like the perfect time to catch up with old friends and family who have just arrived into town, but it should wait. And all the last minute details that just didn’t get finished, that crazy push to the finish; you will have to delegate those tasks to someone else. You need your sleep. The effects of sun damage, both natural and artificial, are well know. Having good skin color can become an obsession for some people. Over-tanning, sunburns, and tan lines can be the results. Even those who are especially careful can make mistakes. The other option, self-tanning lotions, can be safer. However, the tendency towards staining and uneven application is another factor. Try it in advance, be careful and don’t overdo it! Of course, everyone knows they should drink more water. Not soda, not coffee, not alcohol…yeah, that’s a bummer! But it will make a difference. My single, biggest tip is to reduce hand-to-face contact. My husband calls it “bit picking”. Everyone does it; everyone knows they shouldn’t. All you need to do is nothing! Simply wash your face, and leave it alone. Look great. Look knock-down, drag-out gorgeous! But, look like yourself.